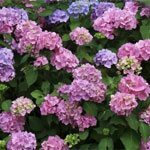 About fourteen years ago I planted ten hydrangea bushes of the broadleaf variety, I think. Over the last four years or so half of them have become stunted in size while the others seem to be growing just fine. They are all planted along the same back northern exposure with a garage about six feet or so behind the bushes which have become stunted. What can be the problem? It sounds like you have a grub or nematode of some kind in the roots of the plants. 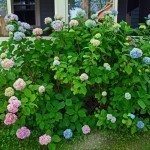 On the stunted ones, try gently lifting the roots and examining them for unusual root growth (knobby or enlarged roots) which would indicate nematodes or grubs, worm-like pests that are normally brown or gray in color. These pests would cause that kind of growth.